With all the different styles found in the world of beer, the question of serving temperature comes up fairly often. There are, however, very few absolute truths when it comes to proper serving temperature. Individual drinkers will have individual preferences and these might vary quite a bit from the generally accepted norms. 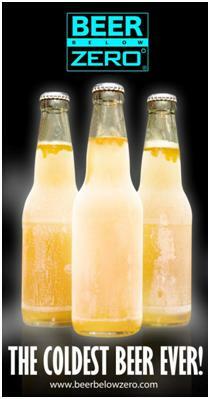 Beer is best served in between “ice cold” and room temperature. While it may be logistically difficult to maintain each style of beer at its ideal temperature in a restaurant or bar, it is far easier to provide glassware at the correct temperature. Many places unwittingly think they are doing a favor to their beer drinkers by offering chilled or even frozen mugs. But unless you just really don’t want to taste that beer, be sure to reject the offer of a frozen mug. Not only will it retard the beer from warming up to the ideal temp, but you may even get an unexpected “gift” in your beer – chunks of ice. Which melt, and turn to…water! On the flip side, you should also reject that mug or glass that comes right out of the dishwasher, and is visibly steaming. A hot glass is no friendlier than a cold glass. BEER BELOW ZERO (BBZ) has made drinking experience more satisfying and fun. Beer taste is heightened and a lot smoother. It gives you an instant icy cool feeling, which is great considering we are from a tropical country. The average serving temperature of beer from ordinary chillers is around 8 degrees Celsius while beers coming out of the BBZ freezers are served between -6 to -10 degrees Celsius. It’s definitely colder than ice. It’s very refreshing….people call it a thirst quencher. Previous story Win a gift certificate worth P1,000 from Blackbeard’s Seafood Island in ATC now!